Aluminium shutters & screens are the first choice for applications such as balconies, patios, external window shades and privacy screens. 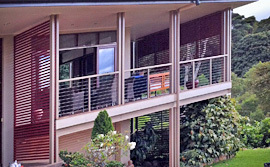 Peachester aluminium shutters and screens are built to withstand the harsh Queensland climate, from harsh sun and wind to the sand and salt of coastal areas. The shutters and screens can be mounted in a variety of ways i.e. hinged, sliding bi-fold and fixed, using only the finest quality stainless steel hinges, runners and catches etc to eliminate any rust and corrosion. They come in a variety of blade sizes and profiles and can be anodized for a natural aluminium look, woodgrain effect or finished in A grade Australian powder coating to the colour of your choice. The team here at Peachester can custom design and build an aluminium shutter system or screen to suit any of your shade, privacy or security needs. There is no better aluminium shutter system than a Peachester.